Mamaearth brings to you a complete solution to take care of your baby from top to toe and even from the mosquitoes. 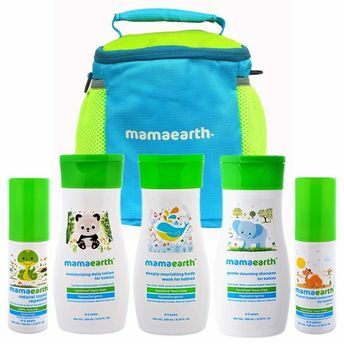 Ideal for gifting purposes the Mamaearth's Complete Baby Care Kit is an amazing combo that includes products that are 100% natural, based on a proprietary blend of essential and carrier oils. The products come packed in an adorable waterproof baby bag with a lot of space to carry all your baby's stuff around. Includes an amazing waterproof baby bag! Additional Information: Bring home Asia's 1st Made Safe Certified Brand. Mamaearth aspires to take care of every parents & baby's wellbeing from head to toe with 100% safe, toxin-free and natural ingredient based international standard products which you can choose for your little one without having to think twice. The brand aims to provide safe natural solution to problems ranging from morning sickness to baby colic in future.